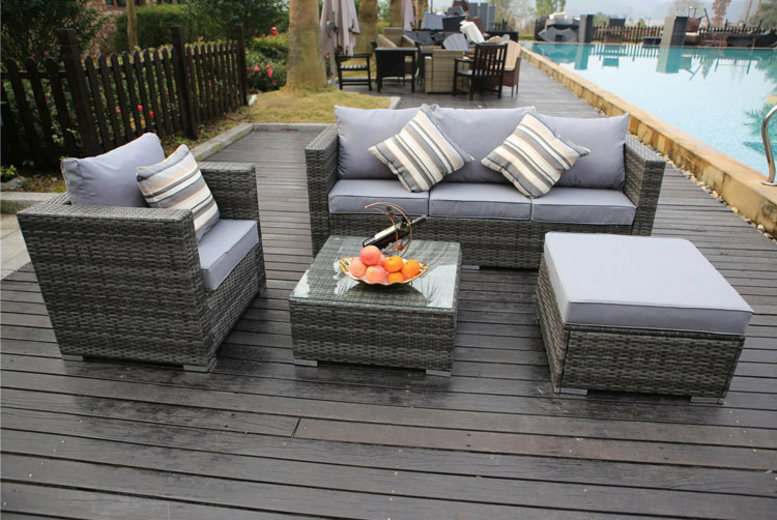 Home » Featured Products » Monaco 5-Seater Rattan Garden Lounge Set & Cover Option – 3 Colours! Monaco 5-Seater Rattan Garden Lounge Set & Cover Option – 3 Colours! Get a Monaco five-seater rattan sofa set in your choice of black or grey or brown. Comes with hand-washable cushions*. Includes a three-seater sofa, single chair and footstool (dimensions below). As well as a glass-topped coffee table. High-quality, handmade furniture (see dimensions below). Upgrade to get a protective rain cover!